This is the title page of every book. 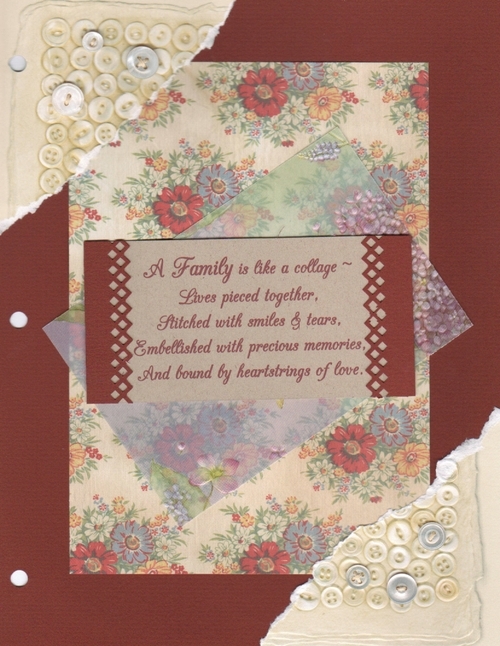 The corner paper with buttons is a beautiful embossed paper to which I sewed on real vintage buttons, three per corner. Below is a copy of the letter that I wrote and added to the front of every book, personalized for each recipient. I do not expect you to read this UNLESS you are contemplating starting such a project yourself. And if you do, please let me know how that works out for you. In the Fall of 2005 I began an extensive project ~ consolidating and organizing all of the photos and memorabilia that I received from the belongings of my parents (Carl and Virginia Lofgren) and my paternal grandmother (Amelia “Millie” Lofgren Davis). This was both an enjoyable and an emotional experience. None of these materials were found in just one box or album. They were scattered throughout the various boxes of belongings. And they were in disarray, probably having been mixed and mingled through years of viewing. Since the photos were from two different households, there were many duplications and/or similarities between the two sets. I had to do quite a bit of detective work, using such things as size, borders and cuts, company markings on backs of photos, etc. to try to identify, group, and date them appropriately. I often looked at clothing and hairstyles to determine if photos were from the same batch/occasion. Where there were handwritten notations on the backs of photos ~ especially on the photos Carl sent Millie or Millie sent to Carl & Virginia ~ the task was made easier. Also, through the years, as I tried to do some preliminary organizing while Mama and Daddy were still alive, I had written some notes on the backs of some photos as they gave me information. This was very helpful, although I certainly wish I had asked more questions and written more notes. As I worked with the photos and other materials, I began to feel a new and different intimacy with my parents than I had felt before. Perhaps that feeling was borne of their absence from me and my greater desire to really know them as they were before they met, married, and created our family. Many of the photos gave glimpses into their personality that I wanted to share with each of you. As I thought along these lines, a project began to formulate in my mind. This album is a result of that thinking. About the album covers: When we closed out Mama’s household in June of 2000, I added what was left of fabrics and sewing notions from both of my grandmothers and my mother to the many similar items that I had collected from them over the years. These things always fascinated me. Millie had assembled large quantities of these types of things when she worked in a “dry goods” store. Both Millie and Mama had carefully disassembled and saved bits of trim and other notions from fine garments ~ with plans to reuse them. I especially loved the vintage buttons and buckles, ribbons, and lace trim. Much of the fancy work was done by Millie as she whiled away the hours, chatting with her many friends or listening to music or radio broadcasts. There were pieces from several quilts (from both Millie’s and Mattie’s households) that had been worn out, cut apart, and reused for various purposes. I had long desired to assemble these materials into some sort of keepsake for each of Carl and Virginia’s off-spring. This thinking lead to the decision to incorporate them into the album covers. The album covers represent our six families. There are similarities in composition and materials, and yet each is unique, as it is composed of many different items. So each of our families has many similarities as we are the offspring of Carl and Virginia Lofgren, yet each is unique as there are different manifestations of that genetic heritage and as the Lofgren~Dudley line has been enriched by each new family line that has merged with ours. I am giving you a start of what I hope will be an ongoing project for your family. I have ideas for many other pages I want to create. I intend to share copies of those pages with each of you as appropriate. I hope that you will begin to create and share pages that will include your contribution to “Our Heritage”, bringing in each of your family lines. Of course, there are many other family names and lines to be included, as we women lose our family name when we marry. The generations of mothers’ lines must be represented as well. It is my hope that some day I will see 6 different albums that evidence the richness and variety of Our Shared Heritage.